After a decade or so of successfully cultivating a fanbase in the ever-expanding indie-folk genre with a handful of solid releases (as well as a surprisingly potent covers record), Vetiver (serving as singer/songwriter Andy Cabic's moniker for almost 20 years now) are about to release what is perhaps their most intrepid album yet with Complete Strangers. Complete Strangers begins with aptly titled 'Stranger Still', a seven-minute collection of lush acoustic guitars swooning upon the gentle pulse of an infectiously lo-fi loop. By the time Cabic begins to croon his way through the first chorus, it's clear that any preconceptions of Vetiver as a good ol’ fashioned neo-folk band are simply not going to fit this time around. 'Current Carry' pushes along with understated AM radio swagger, while Cabot's soulful chorus of "fools rush in" from 'Confiding' is downright sensual. 'Loose Ends' flat-out rocks in a Byrds-by-way-of-the-Gin-Blossoms sort of way, while the one/two punch of the pensively thoughtful 'Edgar' and the charmingly understated 'Last Hurrah' are a beautiful last breath for an album that's only real flaw is that its brevity simply leaves one wanting more. The electronic drums and loops have been there on almost every Vetiver release, but much like Radiohead's In Rainbows, Complete Strangers finds Cabic fully integrating his songs into the production, and vice versa. 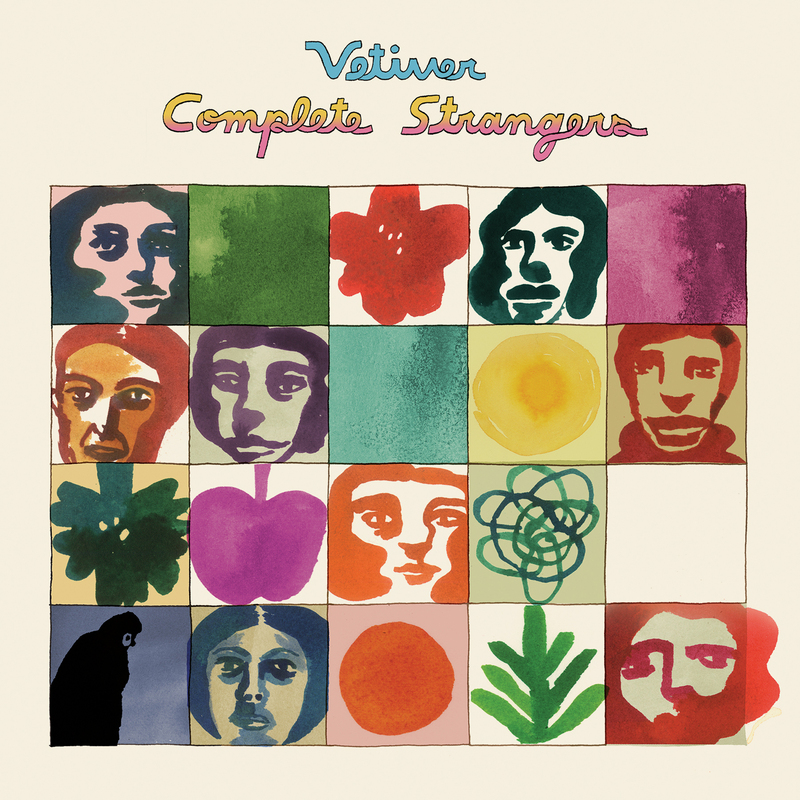 The heavy presence of acoustic guitars that permeated most of Vetiver's back-catalog has been skillfully pushed further into the background, allowing the delicacy of Cabic's lyrics and vocals to take centerstage. The album’s heavy textures and nuanced production make Complete Strangers a headphone-listenening dream. Cabic has stated that Complete Strangers began its life as a collection of demos, and that its birth was a slow and thoughtful process. Where such an admission typically signals the 'over-produced' warning flag, in this instance that deliberately drawn-out approach works very much to the benefit of the overall album. The songs ebb and flow seamlessly into each other, disparately fitting together like pages on a calendar. So for anyone who has ever slept on a previous Vetiver release, content to dismiss them as yet another bay-area folk band, Complete Strangers is the perfect place to finally start with this band, as it is the intriguingly stunning left turn that Andy Cabic has been building his way towards for the better part of a decade.